The Reward Points Service allows Game Developers to assign rewards to users which the users can redeem whenever they want. For instance, one can give 10 gold reward points on completion of a certain game event to the user. Once user has got the reward points he can redeem it further for other goods. To get started with rewards, you have to first create rewards inside the AppHQ console and here are the steps to do so. After creating a Reward you can manage your rewards by using the following API calls from your app. Once a reward is created, you can add reward points to a users account. Reward Points can be earned by the user which can be redeemed later. It requires game name, reward name, user name and reward points to be passed as input parameters. User can redeem his earned rewards for a particular game. Once reward is redeemed it will be deducted from his total rewards. It requires game name, reward name, user name and reward points to be passed as input parameters. You can fetch the list of all rewards earned by an individual user. 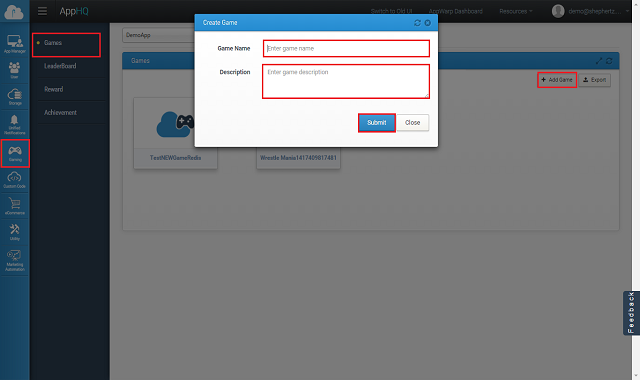 This requires user name and reward name to be passed as input as shown in the below snippet.